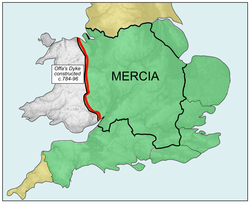 Mercia (/ˈmɜːrʃiə, -ʃə/; Old English: Miercna rīce; Latin: Merciorum regnum) was one of the kingdoms of the Anglo-Saxon Heptarchy. The name is a Latinisation of the Old English Mierce or Myrce, meaning "border people" (see March). Mercia dominated what would later become England for three centuries, subsequently going into a gradual decline while Wessex eventually conquered and united all the kingdoms into the Kingdom of England. ^ "Mercia | historical kingdom, England". Encyclopedia Britannica. Retrieved 28 December 2018. ^ Stenton, F. M. (1970). "The Supremacy of the Mercian kings". In D. M. Stenton (ed.). Preparatory to Anglo-Saxon England. Oxford. pp. 48–66. ^ Kessler, P L. "Kingdoms of the Anglo-Saxons - Iclingas & Mercians". www.historyfiles.co.uk. Retrieved 25 September 2018.